Nimbus, The Industry’s new performance installation, with a newly commissioned score by Rand Steiger, opens Saturday, Oct. 1 as part of Noon to Midnight at the LA Philharmonic. This installation kicks off The Industry’s artistic director Yuval Sharon’s three-year residency as artist-collaborator at the LA Philharmonic. Following is an interview with The Industry’s artistic director Yuval Sharon and composer Rand Steiger. Yuval, why was this the right way to start your three-year residency at the LA Philharmonic? YS: The last few projects by The Industry have blurred the line between everyday life and the imaginary cosmos music invites you to inhabit. In Hopscotch, for example, the live performances added a psychogeographic layer to sites and streets of the actual city; they also activated less conspicuous locations like parking lots, viaduct underpasses, or dirt roads. Either way, art’s ability to awaken the potential within everyday life and expand our perception of it has been a major component to the work I’ve been developing. It seemed like a fitting start, then, to bring that point of view to Walt Disney Concert Hall and show that in such a great space, music and performance can exist in even the least likely of locations. Rand how did you become involved in the Nimbus project? What is your relationship to The Industry? RS: Before this project I was simply a fan of the Industry. But then Yuval heard a piece of mine (Template for Improvising Trumpeter and Ensemble) performed by the International Contemporary Ensemble at the Ojai Festival last Summer and decided to invite me to collaborate on the installation project. I had followed the Industry, and was very intrigued by the extraordinary performance of Invisible Cities that I watched online, and by what I had read about the plans for Hopscotch. When I saw these things I thought to myself “this is exciting and new, and I want to work with these artists”. So I was thrilled when I was contacted by the L.A. Philharmonic about this project. Yuval, what about Rand’s music captured your attention? Why collaborate on this specific project? YS: The concept for this installation was already pretty clear in my mind when I first heard Rand’s piece at the Ojai Festival. I was imagining something like the Austrian composer Wolfgang Mitterer’s sound installations, which rely on complex electronic processes to create a disorienting sense of space in everyday settings. But I obviously wanted to work with a composer closer to home, not just for practicality’s sake, but to build off their connection to music in public spaces here in Southern California. When I heard Rand’s piece at Ojai, with its beguiling electronic layering of a virtuosic live performance, I felt he was someone who would connect with the idea of the installation. When I then discovered his own history with the LA Philharmonic, he became the natural choice — and everything since has felt completely organic. Can you talk about how Nimbus relates to the Angel’s Flight Railway? RS: When we first began to discuss the project, Yuval suggested we draw on Angels Flight Railway for inspiration. Just like the escalators where this project was to be, Angels Flight was a persistent means of vertical transportation, in downtown L.A. on Bunker Hill near WDCH. But more than this, we were intrigued by the way that Angels Flight stayed the same for so long while the city around it changed dramatically. We want our project to similarly transform the experience of traversing the escalator corridor, and to make it different every time you pass through. Yuval, Where does the name Nimbus come from? YS: The short answer to this is from Marc Lowenstein, The Industry’s Music Director, as we researched cloud-like names that weren’t already branded (like the most obvious choice, “Soundcloud”). We went through a lot of iterations to finally get there, though, as the piece developed, including “Vertiginous Tracks,” which seemed like too much of a mouthful; “Angels’ Flight,” in relation to the historic funicular, but on its own seemed evangelical; and even just “Escalators,” which was obviously the easiest but perhaps too prosaic for the feeling we wanted the installation to impart. 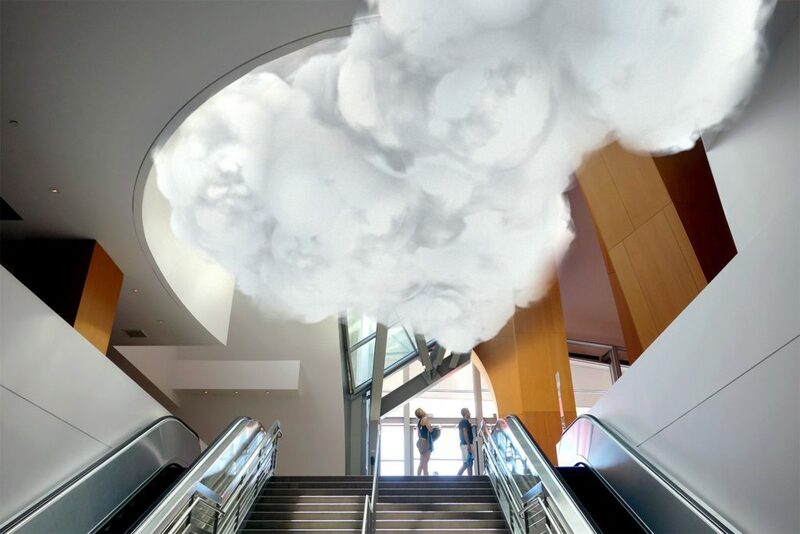 “Nimbus” finally seemed the most direct and easiest to connect to the actual physical installation of the cloud. The installation is extremely multidimensional and even responsive to the viewer’s presence. Have you composed light and sound in such a way before? What is the most exciting aspect for you? RS: Earlier in my career I composed music and designed sound for experimental theater performances. And later I was engaged in a project with Vibeke Sorensen and Miller Puckette where we worked with improvising musicians with real-time computer graphics and sound that responded to their musical gestures. But this installation has some unique challenges and opportunities. The most exciting aspect is also the most challenging – how do we use music, sound and light to transform the space in a way that will endure throughout the season – that will intrigue and surprise people, but at the same time not become unwelcome. It’s not like creating an installation in a museum where people choose to go, and stay or leave as they please. This is in a heavily traveled public space, adjacent to spaces that people work in for hours. People will encounter this installation frequently, and so we want it to be welcoming, intriguing, surprising, hopefully even inspiring, but we also want to avoid it ever being considered strident or otherwise unwelcome. So there are over 20 different compositions, and the program will vary each hour and each day, so that it will never be predictable. It has also been very gratifying to work with Yuval and his team, and with the staff and musicians of the Los Angeles Philharmonic – an incredibly talented, adventurous, and convivial group of collaborators. Have there been any unexpected surprises that have shaped how you are creating the compositions? RS: While I have worked with spatial audio and multiple speakers before, I have not worked at this scale – with 32 speakers. Fortunately we have a room in the Conrad Prebys Music Center at UC San Diego that has the exact same Meyer Sound speakers that we will use in the installation, and I have been able to work with 32 of them as I compose the music for this project. I have discovered that using speakers as individual voices in an instrumental chorus of this scale reveals fascinating new opportunities for spatial polyphony that immerse you in the sound in an intriguing way. And it is quite beautiful to hear 32 tracks of Martin Chalifour on violin, Robert DeMaine on cello, Marion Arthur Kuszyk on oboe, Boris Allakhverdyan on clarinet, Andrew Bain on horn, or Thomas Hooten on trumpet. The pieces featuring Philharmonic soloists will be a highlight of the installation, but there will also be other surprising textures and sounds: a piano that surrounds you with notes and resonance as if your head was in the sounding board; a carillon in just-intonation, with dozens of bells of all shapes and sizes ringing all around you; the sound of wind and water flowing around the space, a rainstorm of thousands of delicate xylophone notes descending; singing, speaking and whispering voices rising. And on October First, as part of the Philharmonic’s From Noon to Midnight event, the installation will branch out as 24 singers become one with it, singing, and ringing handbells, as they walk around and through the space.